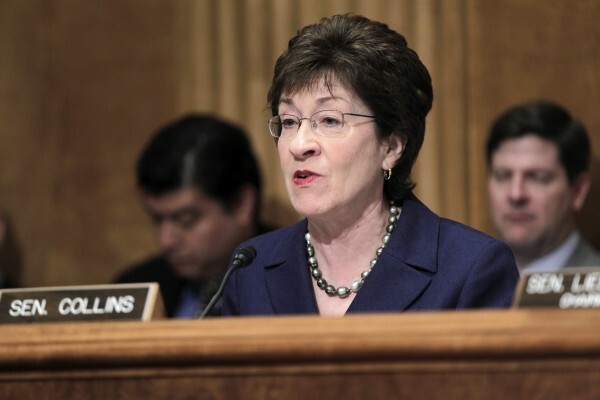 In this March 30, 2011 file photo, Senate Homeland Security and Governmental Affairs Committee ranking Republican Sen. Susan Collins, R-Maine, speaks on Capitol Hill in Washington. WASHINGTON, D.C. — Calling it a monumental victory for Maine residents, customers of the U.S. Postal Service and members of rural communities nationwide, Sens. Susan Collins and Olympia Snowe hailed Wednesday afternoon’s 62-37 Senate passage of the postal reform act. “This is a resounding win for the Maine delegation and Maine citizens, as well as other parts of the country,” said Snowe, R-Maine. The bill still has to pass through the House of Representatives, where a competing bill authored by Rep. Darrell Issa, R-Calif., has not yet been brought up for a vote. “I envision it’s down pretty much to those two bills,” said Rep. Mike Michaud, D-Maine. “As far as what’s going to happen, a lot will depend on how much support the speaker [of the House] gets from rank-and-file Republicans to bring the Senate bill up for a vote. If the vote is delayed, the USPS plan to start consolidating 223 facilities nationwide — including the Eastern Maine Processing and Distribution Facility in Hampden after May 15 — likely would go forward. Under the Senate bill, 86 of those 223 targeted facilities will be kept open because of a requirement written in by Collins requiring the USPS to provide overnight delivery service nationwide. The Hampden plant employs 183 people, all of whom were notified two months ago that 170 of them would be reassigned or let go as a result of its processing duties being shifted to Scarborough’s Southern Maine center, leaving that as Maine’s only processing center. Under Collins’ bill, the USPS would get an $11 billion refund of overpayments made to a federal retirement and health fund to pay down debt and finance buyouts to 100,000 postal employees. “I believe the bill will help put the Postal Service on sound financial footing as well as save the Hampden processing center,” said Collins. Collins’ bill would stop any shutdowns before the November elections, protect rural post offices for one year and require six-day USPS delivery service for two years. Tom Rizzo, the USPS’ Northern New England District spokesman, said unless he’s notified otherwise, the plants designated for consolidation will begin downsizing after May 15. Hours after Rizzo’s comment, Postmaster General Patrick Donahoe confirmed in to senators Tuesday that Collins’ bill would keep the Hampden facility open if passed. Rizzo had no official statement by USPS officials reacting to Wednesday’s Senate vote as of press time Wednesday night. Postal facilities were evaluated for potential shutdown or consolidation through a national study started last August because of USPS financial woes attributed to annual operating losses and a need to cut $20 billion in operating costs by 2015. “We understand they’re facing enormous fiscal hardship. No doubt,” said Snowe. “But they’ve always taken more of a blunt approach to addressing it. Snowe added a bill amendment Tuesday which was unanimously enacted that requires the Postal Regulatory Commission to independently verify USPS figures and methodology used for determining plant consolidations.